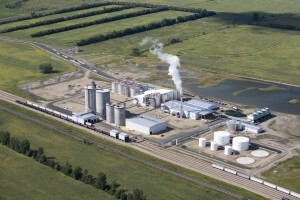 An aerial view of the ethanol plant near Hankinson. Photo courtesy of Hankinson Renewable Energy. North Dakota corn-based ethanol facilities have the capacity to produce a combined total of nearly 450 million gallons of ethanol each year. The North Dakota Ethanol Council estimates that 156 million bushels of corn are utilized in the state each year to produce ethanol. North Dakota is also home to a canola-based biodiesel facility at Velva. This ADM facility has a production capacity of 85 million gallons of biodiesel per year. 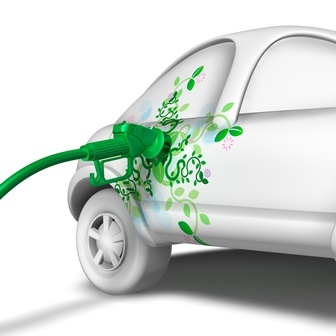 Work is also progressing in the development of the next generation of technologies and feedstocks for the biofuels industry. Researchers at North Dakota State University estimate that bioenergy production could contribute an estimated $800 million in direct annual economic activity in the state. 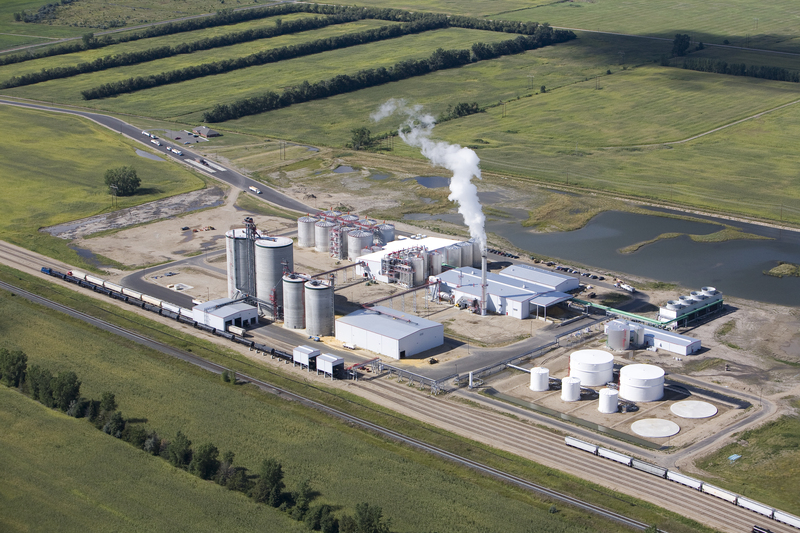 North Dakota’s five ethanol plants have an annual production capacity of nearly 440 million gallons per year – a more than ten-fold increase since 2005. The state’s ethanol industry generates more than $640 million in economic activity each year and directly employs almost 230 workers across the state with an average annual wage of $64,000. Approximately 10 percent of the ethanol produced annually in North Dakota is blended with gasoline and sold within the state. The remaining 90 percent is shipped primarily to the east or west coasts. In a modern ethanol facility, one bushel of corn produces 2.8 gallons of ethanol, 18 pounds of livestock feed (DDGs), and 18 pounds of carbon dioxide.